Checkout is 10 AM. This checkout time allows us to have a chance to thoroughly clean the guest room for next visitor. No, Sorry we do not allow pets, however there are places on the Island that do allow pets, we are just not one of them. Note There are no pets allow on any beach on the island. First car Free, Second car 25 dollars. No more than 2 cars per room. The second can fee can be waived under certain circumstances, our facility is much nicer when everyone bring just one car. What is the Tax Rate for accommodations? 11.5 %. 6.5 % Sales Tax and 5% Resort Tax for Manatee county for any rental under 6 months. Yes, All rooms have cable TV with about 70 to 100 channels and our TVs are 42 inch Flat screen TV. Do your rooms have DVD Player? Yes, We have DVD Player and Play Station2 Video game machines. Do you have outdoor Barbeque Grills? 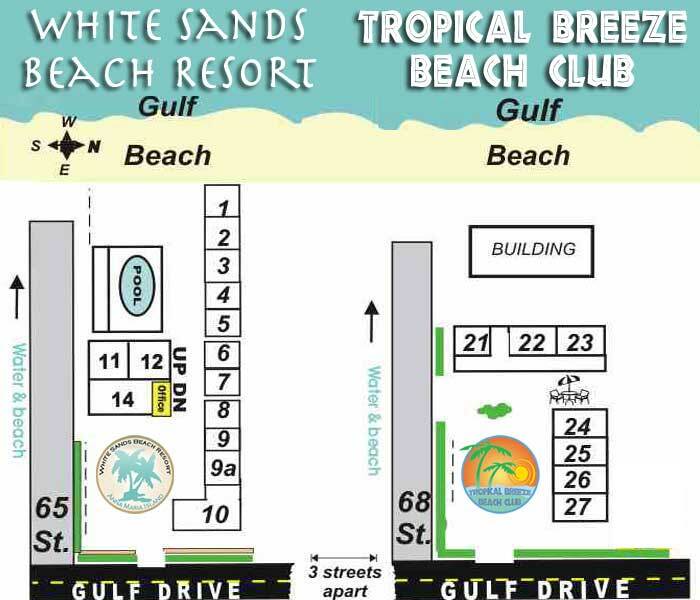 Yes, We have provided 6 charcoal grills for customer use at Tropical Breeze Beach Club and 12 charcoal grills at White Sands Beach Resort. Guests must supply their own charcoal and charcoal fluid. The Grill when lit must not be placed under roof or within 12 feet of unit walls. Are we allow to have Parties? Absolutely NOT. NO PARTIES! Guests come to our resort to get away from the parties. We will immediately evict room guest having parties, no warnings and guests will forfeit their deposits. Try Daytona, Miami, Clearwater or Panama City. Do you have Maid Service? No, We do have a daily towel exchange, and weekly sheet exchange. We do not enter your room during your stay unless maintenance is needed or we are requested. We can arrange daily maid service for you apartment at a rate of 15 dollars and hour. Yes, we supply room towels. We do not supply Beach towels. Bathing suit, T-shirts, flip flops, a hat and, a great altitude. All of these are not a requirement and can be rented or purchased on island, but you can save yourself a bit of time and money if you bring it from home. If you are driving I would recommend bring basic cooking condiment and spices, Coffee, salt & pepper, mustard, ketchup, oil, and cereal for the kitchen. We do not supply Bath Supplies like Shampoo and conditioner and skin lotion. Beach supplies like suntan oil, hats, beach towels, folding chairs umbrella, pool noodles, fishing gear, kayaks, bikes and Red filter flashlight for late night walking. We do also keep around beach toys for children like buckets & shovels and items that have been donated like folding beach chairs ,noodles. These are available on a first com first serve basis.